Designed for use in oven monitoring or other applications where a simple ¼-20 mounting bolt/screw is needed. The thermocouple sensor can withstand constant temperatures of 204°C (400°F) and 315°C (600°F) intermittently. The stainless steel braided cable provides abrasion resistance and easy installation into cable trays or ducts. 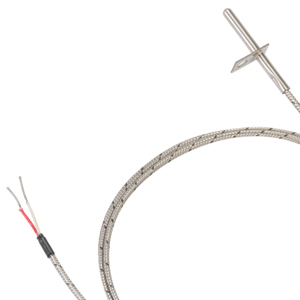 The sensor can be customized with a longer probe length, longer cable length, or other thermocouple type. Mounting Hole: 5 mm (0.2") dia. Note: For grounded junction, change “U” to “G”, no additional cost.